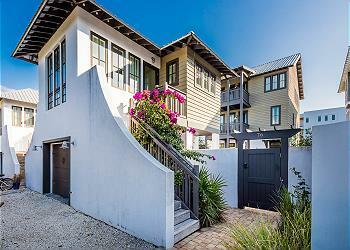 LOCATION: This home is walking distance to the beach. DETAILS: This home is in a prime location with easy access to the beach and overlooking Rosemary tennis courts. The gourmet kitchen boasts beautiful stainless steal appliances and modern, exposed shelving. Adjacent to the kitchen and dining room, you will find the spacious living room that is outfitted in stunning interiors and features an incredible indoor shuffle board! Just up the stairs to the second floor you will find ample living space for you and your family. You will find two guest bedrooms, one with a private sitting porch, private bath and a plush queen bed. Don't miss the kids lounge and desk workstation located conveniently outside of the kids bunkroom! On the third floor you will find an additional guest bedroom, with a queen bed and ensuite bathroom. Just down the hall is the stunning master bedroom equipped with an ensuite bathroom, king bed and pool & tennis court views! Connecting the home to its carriage house is a gorgeous outdoor living area and pool. This carriage house is not only private, it's well equipped! It has a pool & tennis court views, a kitchenette and a cozy bedroom wrapped in shiplap. AMENITIES INCLUDE: 5 adult bikes provided, great outdoor space with a private pool. This property comes with 3 dedicated parking spots. Complete Clean Linen Participant - ALL linens, including comforters laundered upon every checkout. We had a fabulous week at “shuffle by the sea”. The house was equipped with everything we needed and exceeded our expectations. It was just a short 2-3 minute walk up the road to inlet beach which was very convenient and a 5 minute walk to the shops and restaurants at Rosemary beach. 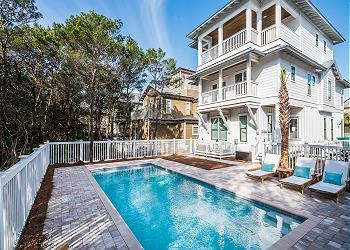 We are so glad that you enjoyed your stay with us in Inlet Beach at this spectacular home! We agree that this home is situated in a great location making it very easy to enjoy all of the surroundings! Thank you for staying with 360 Blue, we hope to see you again soon! Wonderful property and perfect for our family. We were there for a huge wedding on St. Augustine Green and our house was used for the groom and family photos! It was so accommodating for visitors from all over the US who were stopping by to greet the groom and his family. On the last day we thought there was a bike missing, but the photographers had asked the groomsman to ride too the wedding sight for pictures,so they were all accounted for! Thank you so much and we hope to come back soon! Only problem we had was the door alarm having to be pushed every time someone came in or out! Otherwise it was great for all! We are so glad we were able to host you all for such a wonderful occasion and that you enjoyed this amazing home! We apologize for the alarm, however, it is a state law to have a pool alarm for any vacation rental for the safety of our guests. We hope to see you all again soon! Although we had some issues with the house which were a plumbing issue and AC, the 360 Blue staff was very receptive and did everything in their power to provide excellent service! I would rent through this company again. Thank you for choosing 360 Blue! We loved having you with us and though there were bumps along the way we are happy we were able to get them resolved for you. We hope to see you back soon!